Chef Iwona Palussek cures her salmon with fresh horseradish and beets, which intensifies the ruby color. Unless you have German roots, you may not often experience a hankering for the country’s cuisine, which you might have good reason to think of as heavy on meat, bland potatoes and funky fermented or boiled cabbage. Sort of the antithesis of Florida-Caribbean cooking, with its tendency toward fresh, quickly cooked seafood, citrus and other fruit flavors, and dishes that are light on the palate to suit the tropical lifestyle? Not always the case. In the hands of a chef like Iwona Palussek of Tasty Cultures, traditional German and Polish specialties present as more modern, less overpowering. Take, for instance, the Polish golobki she serves at the Cape Coral restaurant she owns with her husband, Robert. In lesser hands, they could turn into dense shells of tough cabbage leaves burdened with ground meat tamped into leaden capsules and then buried under thick, overcooked tomato sauce. At Tasty Cultures, those cabbage leaves come out so thin that they’re fork-tender and practically transparent, revealing a flavorful, textured blend of meat and rice inside. To top them off, Chef Palussek makes a light, golden sauce with fresh tomatoes. FORT MYERS READERS: Sign up for Florida Weekly’s Fort Myers email edition here. 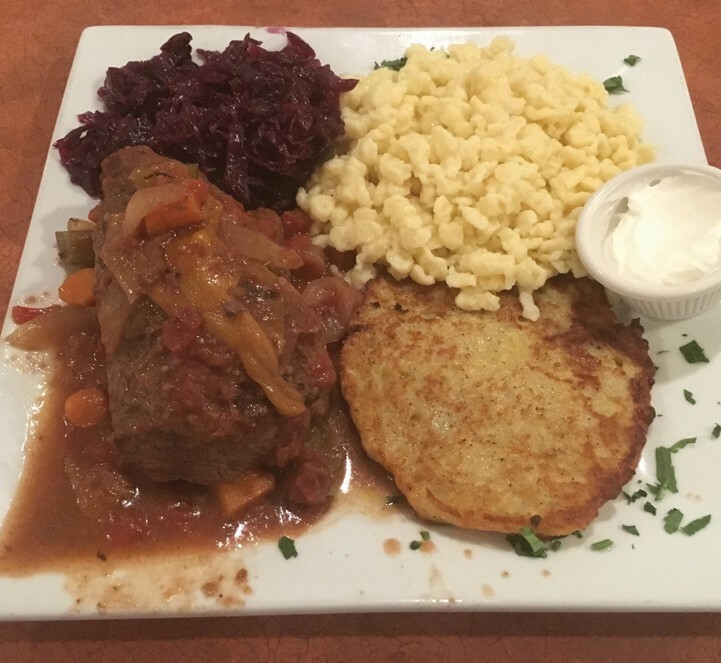 Beef rouladen with boiled red cabbage, spaetzle and a potato pancake. With a nod to the slow-food movement, she sources pork and other products locally when possible, cures her own bacon and makes her grandmother’s pierogi recipe from scratch (“best in Florida”). “Our core values of food integrity and food responsibility are the drivers for our commitment to deliver one meal at a time, the healthiest, freshest ‘home-cooked’ style dishes to our customers,” they say on their website. All this in a seemingly nondescript commercial strip that resembles every other plaza on Del Prado Boulevard. Once you step inside, though, it’s surprisingly stylish: mint green walls, glossy black furniture, simple metal artwork sparingly hung around the two partitioned dining rooms. One side has a steam table, while the other has a bar. The Palusseks, who grew up in Europe and moved to Southwest Florida in 2014, opened their restaurant about two years ago. Apparently, they’ve developed a following since then; the restaurant was fairly busy on a Wednesday night, and clearly some of the patrons were regulars. The chef made the rounds, chatting with every table in the house. The spirit of hospitality is shared by her staff. One of the servers even brought us an extra scoop of mashed potatoes because she thought her colleague had been stingy with our serving. Not that we had any shortage of food; you’re unlikely to leave Tasty Cultures wanting more. Whet your appetite with German and Polish beers (the wine list is minimal but international) while considering your food options. We enjoyed a couple of Polish brews that were new to us: Tatra, ($5.75) a malty pale ale, and Zywiec ($4.50), a crisp lager. Having just five appetizer choices make it easier to get started. Chef Palussek’s pierogi (3 for $8), made from her family’s century-old recipe, are a must. They can be ordered pan-fried or boiled with sauerkraut-mushroom or potato-cheese filling; the former has more texture and flavor, but if you’re not fond of tangy cabbage you’re more likely to enjoy the milder potato filling. We ordered both fried, and the delicate, thin-skinned dumplings had golden, crusty edges. 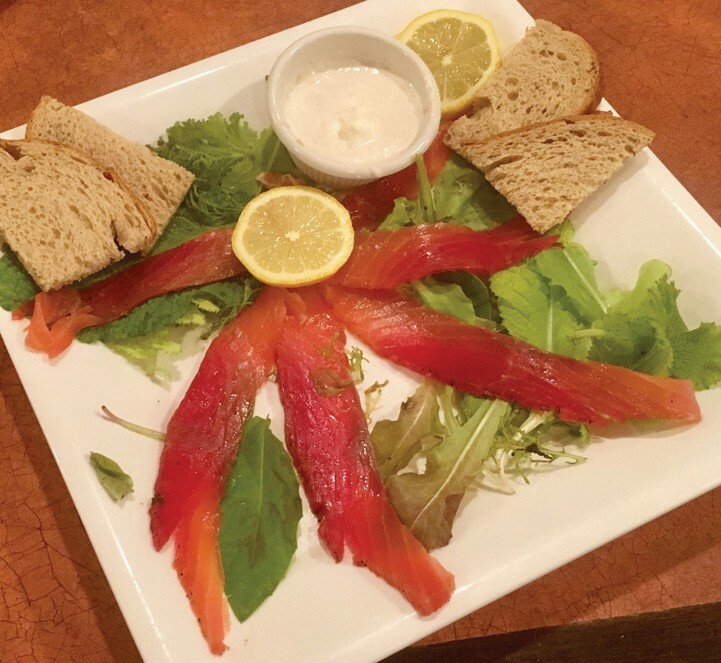 I was surprised to see house-made Scandinavian-style gravlax ($11) on the menu and was eager to try it. 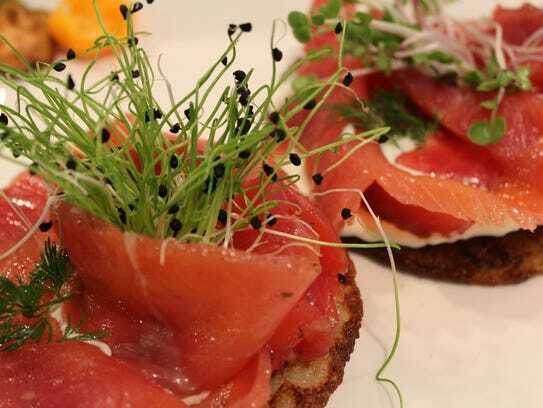 Chef Palussek cures her salmon with fresh horseradish and beets, which intensified the ruby color without tainting the fish’s flavor (I am not a fan of beets in any shape or form). The salty, jewel-toned fish was sliced into long strips that had a pleasurable toothsomeness to them, and arranged like flower petals around a lemon half in the center of the plate to striking effect. The fish was served with sliced rye bread, crème fraiche and a handful of past-its-prime spring mix. The tired greens were hard to overlook. But the only other significant flaw in an otherwise well-executed meal was that our waitress offered us a soup-orsalad option but then never delivered them. Decisions became more challenging with the main course. Schnitzel or sausages? Hungarian goulash or Bavarian roast duck? There are a few less-expected dishes such as lamb osso buco, Koenigburger klopse (German meatballs in creamy caper sauce) and Polish bigos (sauerkraut braised with a variety of meats and mushrooms). 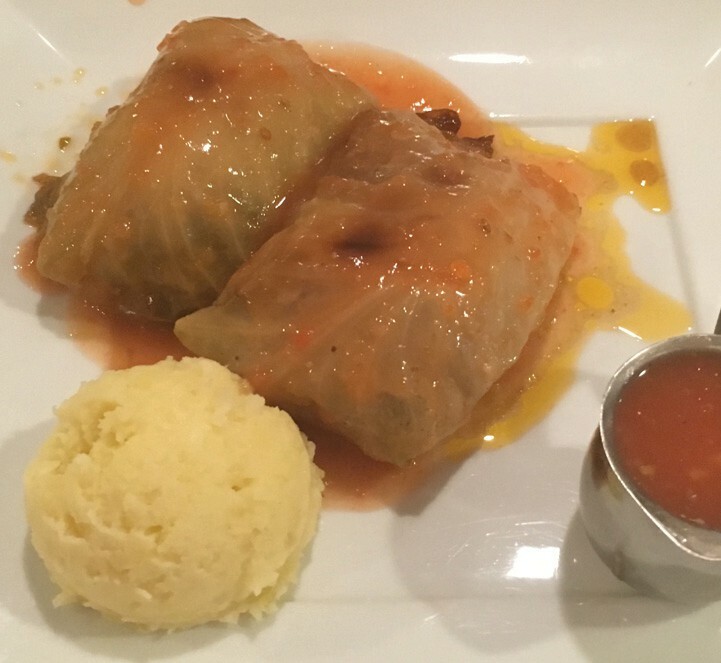 I’ve already sung the praises of the cabbage rolls ($16), which were stuffed with ground beef, veal and pork as well as rice and fresh herbs. So now let me commend the Schwaebische beef rouladen ($20) named after a culturally distinct region in southwestern Germany. The dish consists of a thin cut of beef, usually round or chuck, wrapped around a savory filling of bacon, onions, peppers and pickles. The roll is then browned and braised until the meat is so tender it can be flaked apart with a fork — as it was at Tasty Cultures. A pan gravy with chunks of carrot, tomatoes and silky onions gave it final flourish of flavor. The serving includes remarkably sweet boiled red cabbage and a heaping mound of tender homemade spaetzle. I added a potato pancake because I spotted them at another table and had to try one; it had a crisp golden crust and creamy shreds within. You might say we were on a roll with our meal, literally and figuratively. 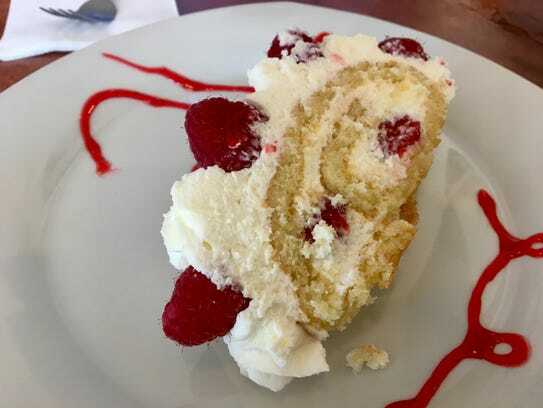 So we opted for another cylindrical creation for dessert, an Austrian cream roll ($8), a white sponge cake rolled with a layers of thickened cream and garnished with raspberry sauce and berries. We had no regrets over forgoing apple strudel for this heavenly creation. With German and Polish food this good, rendered with modern palates in mind, I just might get a hankering for more Tasty Cultures. When Iwona Palussek isn’t hand-crafting Polish and European fare at Tasty Cultures, she likes to dine out at family-owned restaurants around town. In her family’s kitchen, Palussek learned how to create the scratch-made items featured on her menu, dishes such as pierogi, potato pancakes and stuffed cabbage rolls. “Still today I call my grandmother that is over 90 years old, and I ask her to give me recipes,” Palussek says. When she’s not up at 5 a.m. to visit the farm where she buys her organic produce or bake one of her famous Austrian-cream rolls, Palussek likes to eat out around town at family-owned restaurants. Tasty Cultures, a German-Polish restaurant, is open in Cape Coral; Crab Trap is returning to Fort Myers; Ocean Crab House is coming to Lehigh, plus the rest of the week’s dining news. Golobki and schnitzel, goulash and pierogi. 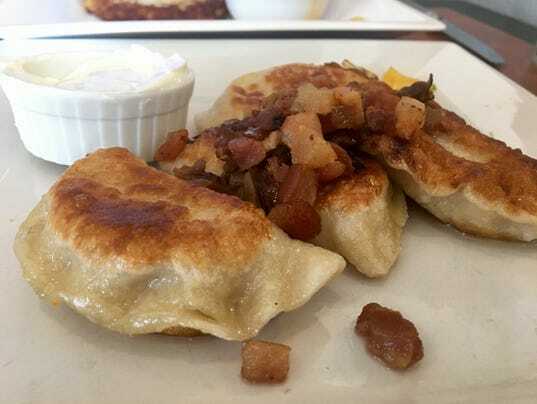 The menu at Tasty Cultures in Cape Coral is a mix of Polish, Hungarian, German and Austrian foods, a reflection of owners Robert and Iwona Palussek’s German and Polish heritage. The new restaurant opened Nov. 4 and, according to Robert, has received great community support. “It’s always been Iwona’s dream,” Robert said. The idea for the restaurant grew as friends and family raved about Iwona’s food. Tasty Cultures’ menu includes house-made Scandinavian gravlax, Bavarian roasted duck, and bigos, a Polish dish of slowly braised short ribs with sauerkraut and porcini and cremini mushrooms. Liverwurst sandwiches, panini and homemade soups are on the lunch menu, along with sides such as German potato salad and red cabbage with bacon. Iwona is sourcing from local markets and farms. Daily specials are designed around what’s local and in-season, with takeout also available. For customers in a rush, a steam table holds ready-to-go, from-scratch items, and Iwona hopes to add meal delivery service in the future. The restaurant seats 86 and offers beer and wine. Hours are 11:30 a.m.-8 p.m. Monday to Thursday and 11:30 a.m.-9 p.m. Friday and Saturday. Visit Tasty Cultures at 4518 Del Prado Blvd. S., Cape Coral. For more information, call 540-6300 or visit facebook.com/tastycultures. It sounds like an international yogurt shop, or a specialty food boutique selling kombucha and sourdough starters from around the world. Cape Coral’s Tasty Cultures sounds like a lot of things. 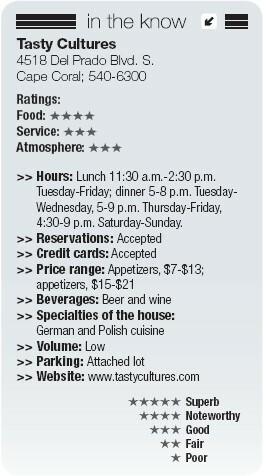 Soulful Polish-German-Hungarian restaurant isn’t one of them. And yet here you are with a plate of pierogi speckled with sweetly caramelized onions and lardons of house-cured bacon (whaaat?!). The pillowy dumplings cut like velvet, their rich potato-cheese filling smudging the plate. It’s a far cry from yak yoghurt and fermented tea — and for that we should all be grateful. Tasty Cultures opened in November in the former Belvedere Bistro space in a Del Prado strip mall across from Siam Hut. Belvedere Bistro was also Polish, in a kooky, haphazard way that involved light-up plastic Santas and some funky sort of stage. Robert and Iwona Palussek, Tasty Cultures’ owners, have made a more honest restaurant of the space. They’ve brightened it and opened it up for better flow. A cafeteria-style counter lines the back right half of the dining room, for quick takeout orders at lunch. A beer-and-wine bar lines the back left half, for icy bottles of Grolschand Zywiec, or generous pours of interesting reds and whites that are as likely to be from Lebanon as they are Napa Valley. The Palusseks have good taste. He hails from Germany, she from Poland. They got the idea to open a restaurant when friend after friend raved about Iwona’s cooking. They wanted to create a place that was like their home, with a kitchen that sourced locally and organically, as Iwona did, and a menu that featured the foods the couple grew up eating. That means thinly pounded schnitzels fried to a greaseless crunch, and Hungarian-style goulash spiced with paprika and caraway then served with potato pancakes all thick and crisp. 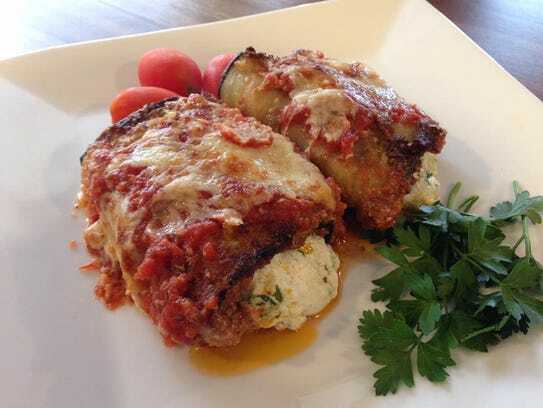 Specials could include chicken paprikash over egg noodles, or eggplant rollatini packed with five cheeses and spinach in Iwona’s own marinara. These are all wonderful, don’t get me wrong, but it’s the Polish dishes where Iwona most shines. Her buttery pierogi, which can also be filled with sauerkraut and mushrooms, are a must. As are her meat-and-rice-stuffed golabki and her stick-to-your-ribs bigos, a Polish stew packed with braised short ribs, more mushrooms and more sauerkraut. She serves it over mashed potatoes, for an extra-extra layer of comfort. Iwona roasts a half duck till the skin is shellacked and crisp, the meat melting. She pairs it with potato dumplings and braised red cabbage with a bright tang. There was some confusion about that cabbage one night when an extra side of it went missing. And there was more confusion about an order of potato pancakes the waitress thought we wanted as an appetizer when really we wanted it as an entrée with the goulash. Entrees quickly followed and the mistake was corrected, though we were left with an overflowing table of food (not that anyone paces meals anymore). Were this a $25-per-entrée place I’d be bothered. But it’s a $14.99 and sometimes a $10.99-per-entrée place. At lunch it’s a $6-per-entree place that’s as filling as it is fresh.